Many of the spring fashion collections featured simple looks layered with a vest. The vest is a great way to add interest to your outfit and is a perfect way to layer. Give your everyday style a little edge. If it's still cold where you live, try a fur vest over your shirt or leather jacket until it warms up. Go rock and roll with a black leather biker vest, or bring it back to the 90s with a washed out denim vest for warmer days. Wear it over your favorite shirts and pair it with jeans. Try a tailored vest layered over a white shirt and your favorite pair of pants for the day time. During the day you can also wear your denim vest over a flowy dress and gladiator sandals for a bohemian look. At night, put your vest over a little black dress (LBD). It will look laid back but put together, and doesn't look like you tried too hard. A vest is a great contemporary piece that can take your outfit from simple to cool. The vest is also great if you feel like covering up your upper body. For the days when you just want to cover that belly a little, the vest provides just the right amount of coverage. 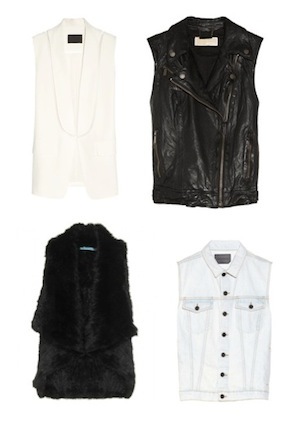 The vest is a versatile piece and one of spring's must haves! My best friend has a leather vest we call Lucy; she goes wherever my friend goes so we decided to her name her. So whether you decide to go with a leather, jean or silk vest, invest in one that you love because you might never want to take it off!